The Russian tennis player Maria Sharapova will not participate in this year’s U.S. Open, even though she will continue preparing for future tournaments under the guidance of her father, who has suddenly become her new coach. The Russian tennis player Maria Sharapova will not participate in the U.S. Open in tennis, according to the tournament’s official website on Twitter. Sharapova, champion of the U.S. Open in 2006, was seeded number three at this year’s tournament. The reason that the third-seeded world tennis player has decided not to participate in the tournament is an injury to her right shoulder. “I just want to say that it was a really tough decision. Since Wimbledon, I did everything I could to prepare for the U.S. Open, but there just wasn’t enough time. I passed a lot of tests, listened to a lot of opinions, and it all came down to the fact that I need time for my shoulder injury to heal properly. It’s not easy to miss one of my favorite tournaments, but I understand that this decision will help me get back on the court faster,” wrote Sharapova on her official Facebook page. “I plan to rest during the next few weeks. I will take the full treatment and undergo a rehabilitation course. I'll miss the U.S. Open,” the tennis player wrote. The media had previously reported that, for marketing purposes, the Russian tennis player intended to change her name to Sugarpova for the duration of the U.S. Open. This is the name of a brand of candies created about one year ago, and the symbol of this brand would have been imprinted on the Sharapova uniform that she would wear during the tournament. However, a short time later, the athlete abandoned this idea. This injury and the forced absence from the Grand Slam are not interfering with Sharapova’s training process. Less than one week ago, the tennis star ceased her cooperation with the legendary Jimmy Connors. The formal reason for this was her defeat by American tennis player Sloane Stephens, during the first match of a tournament in Cincinnati. The Russian tennis player managed to work just six weeks with Conner, who is the winner of eight Grand Slam Men’s Singles Tournaments. 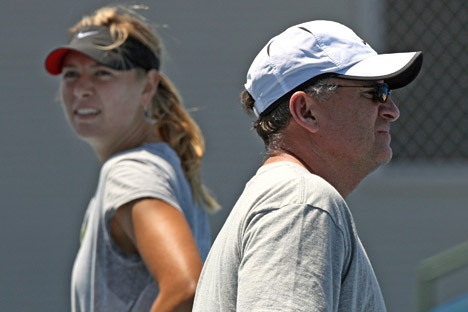 Yet Sharapova found a solution: Her new coach will now be her father, Yuri. This seems rather surprising, as relations between father and daughter had been quite tense recently. This tension was due to Slovenian basketball player Sasha Vujačić — Sharapova's boyfriend at that time. According to her father, he was not a good match for his daughter. During a flight from Belarus to the United States, Yuri discussed his strong misgivings about Sasha with Maria. Sharapova could not calm down her father and became so upset that she stopped communicating with him. Eventually, Sharapova left the basketball player, ending their relationship in 2012. Gradually, the relationship with her father began to improve. With this decision to train under the guidance of her father, the third-seeded tennis player has made it clear that problems between father and daughter have been resolved, and all past grievances have been forgotten. The U.S. Open will be held in New York on Aug. 26–Sept. 9. Based on materials from RIA Novosti and Gazeta.ru.